Sayanasana (the couch posture, more commonly known as an elbow stand) is most commonly found in the Ashtanga fourth series. I’ve also seen pictures of BKS Iyengar demonstrating the posture in Light on Yoga. 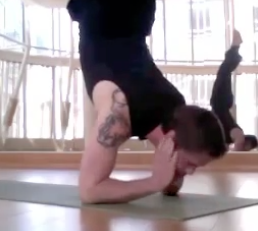 This crazy pose is a notch or two harder than the typical forearm stand and is as meditative as it gets, since thinking about anything else at all typically results in an epic crash and burn. This, coupled with the focus required to balance, will momentarily clear your mind like nothing else. Caveat Emptor: This pose is serious business! Stay safe by making sure that you have someone to spot you, use a wall to practice, or come visit me in Boston and we’ll give it a go together.